AWS has enabled us to automate testing and staging. Developers can now see the impact of code committed to production in 10 minutes, versus 60 minutes in the previous environment. Founded in 2008, Vpon provides mobile advertising services, including analytics, for businesses such as McDonald’s, Coca-Cola, American Express, and Citibank. The business operates in more than 750 cities across Asia, including Beijing, Guangzhou, Hong Kong, Shanghai, and Taipei. Its user coverage spans more than 600 unique smart devices, and the company ranked third in Forbes China’s Top 100 Privately Held Small Businesses in 2015. Vpon started operations using a combination of on-premises hardware and collocated equipment in data centers in Beijing, Taiwan, and Japan. However, rapid growth in data volumes and advertising requirements from existing clients started to overwhelm the capacity of the company’s infrastructure. The issue needed resolving because Vpon had plans to expand into international markets. The organization started to review alternative options for its infrastructure, aware that any solution’s tools had to seamlessly process traffic from Google, Alibaba Group Holdings, and other Internet businesses. Furthermore, using AWS would enable Vpon to provide an infrastructure that could accommodate the demands of bigger customers - including supporting demand peaks during advertising campaigns - and provide the resources to support the company’s requirements in minutes. Vpon is now running in an AWS infrastructure environment that supports two primary systems: a demand-side platform (DSP) and a seller-side platform (SSP). The DSP is designed to help advertisers optimize the performance of campaigns, while the SSP is designed to optimize the yield of publishers and app developers. The DSP portal uses an Amazon Redshift data warehouse to help provide clients with real-time, accurate reports. A MySQL database running in Amazon Relational Database Service (Amazon RDS) captures statistical data to enable clients to view the performance of advertising campaigns in real time, while data is archived in Amazon Simple Storage Service (Amazon S3) for detailed analysis by Vpon’s data scientists. The company uses AWS Lambda to automate repetitive tasks and to archive aging data. Amazon DynamoDB is used to distribute data across different AWS regional endpoints such as Asia Pacific (Tokyo), China (Beijing), and US East (N. Virginia). Vpon also uses Amazon Redshift to collect statistics for the SSP, which are then verified in Amazon DynamoDB and archived in Amazon S3. 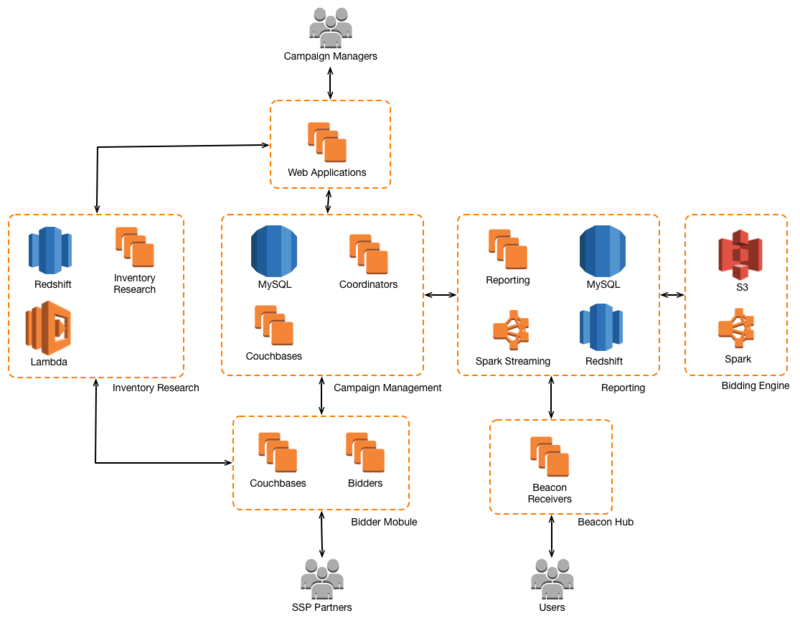 The company’s data science team then launches clusters of Amazon Elastic Compute Cloud (Amazon EC2) spot instances to run Amazon EMR. This is used to scrutinize customer data and provide feedback to customers to improve the performance of their advertising campaigns. The business also uses AWS Support and has subscribed to the Business support plan. Jong is pleased with the rapid, technically skilled response he receives. “Whenever we have questions or issues, we will contact AWS Support. The team is very quick to respond and resolve our issues,” Jong says. In addition, Vpon can now provide its developers with individual testing environments, rather than require developers use a single environment that may not be configured appropriately for some of their activities. These activities include researching new algorithms, stress-testing against different configurations, and piloting new features under development. “AWS has enabled us to automate testing and staging. Developers can now see the impact of code committed to production in 10 minutes, versus 60 minutes in the previous environment,” says Jong. Due to this accelerated development, quality assurance, and staging program, the business has been able to break its weekly aggregated updates into smaller, digestible updates every three days. Vpon is on target to cut its infrastructure costs in half once the business completes the process of optimizing its AWS environment. This new cloud infrastructure will position Vpon to support an anticipated twentyfold increase in business over the next two years. The availability of AWS Regions around the world enabled Vpon to position infrastructure close to the servers of its multinational clients, reducing average network latency from 100 to 200 milliseconds to fewer than 10 milliseconds. Vpon is also able to scale its AWS infrastructure to support demand peaks during seasonal campaigns, when traffic can be three times higher than normal, without having to purchase any physical hardware. To learn more about how AWS can help with big data, visit our Big Data details page.